Fenesha Hubbard and friends hold uplifting signs on May 2, an act they're reprising Friday. CALUMET HEIGHTS — A hug can change your entire day, Fenesha Hubbard said. "I know for me it fills my spirit, and I want everyone to have a good feeling about themselves," said Hubbard, an education consultant. "I have had some people tell me they have not had a hug all week. You never know what a person is going through or how their day at work or school might have been, and a little kindness at the end of the day could make all the difference." That's why Hubbard and her friends will be giving free hugs and spreading good cheer outside of Walgreens at 87th Street and Stony Island Avenue Friday evening. 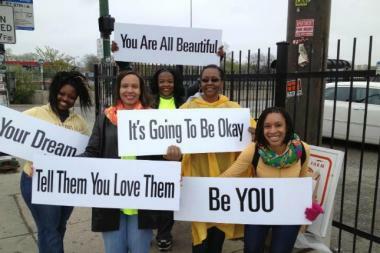 From 4:30-5:30 p.m., the 34-year-old Hyde Park resident and nine of her female friends will be holding up signs filled with encouraging phrases like have a nice day" or "You are loved." 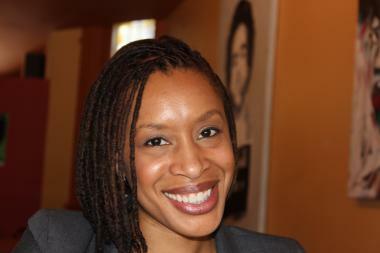 Fenesha Hubbard is the Chicago ambassador for the Happiness Sprinkling Project. "The goal here is to make people feel good. A hug can do a lot for a person," Hubbard said. The former Chicago Public Schools teacher now serves as the Chicago ambassador for the Happiness Sprinkling Project for the Anacortes Center for Happiness, a for-profit corporation in Anacortes, Wash.
Laura Lavigne, founder and director of the Anacortes Center, said the project is unique because its goal is to lift people up. The Happiness Sprinkling Project has sprung up in 15 states, such as California, Oregon, Ohio, Virginia, Florida, and Washington and Canada. But this is not the first time Hubbard and her friends have shown friendly gestures. On May 2 the group occupied the corner at 87th and State streets holding up signs and offering hugs to strangers walking by. "I love it. To see the look in a person's eye when you catch them off guard by offering them a hug is priceless," Hubbard said. "And then to see how they start to smile and perk up from a hug, hand shake or a simple conversation truly makes it worth my while." The idea to become a volunteer for the project derived from a business meeting Hubbard attended in Portland, Ore., in February. And Hubbard said she is not afraid of men getting fresh with her when hugging and shaking hands. "Common sense is always the best tool we use on the street. If it does not feel right then we walk away. Plus I have mace, so watch out," Hubbard joked. "I have not had a problem with men touching me the wrong way and I hope that never happens." In the coming months, the group can be found from 4:30-5:30 p.m. at 55th and State streets on July 5; State Street and Monroe Avenue on Aug. 2; un undetermined location on Sept. 2; Roosevelt Road and Wabash Avenue Oct. 4; 95th and State streets on Nov. 1; and at a location in Pilsen on Dec. 6.